Check-in at 05:15 hrs at Malta International Airport for your Air Malta flight departing at 07:20 hrs arriving in London Heathrow at 09:45 hrs. Upon arrival in London, you shall be met by a local representative who will guide you to your bus for the transfer to Southampton port for check in formalities to board the Norwegian Spirit. Once on board and settled in your cabin, enjoy the freedom and the All-Inclusive concept of this beautiful and welcoming Norwegian ship. You are guaranteed the best of service by the friendly and attentive staff of board, which will do all possible to make your coming cruise vacation a one to remember. On your first day at sea, you have the perfect opportunity to familiarize yourself with the numerous facilities on board. The ship itself is a great experience, the perfect blend of world-class amenities and classic style. 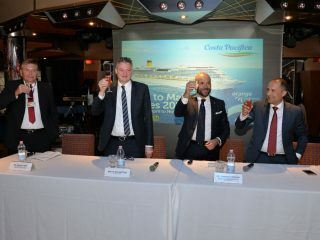 Treat your taste buds to a selection of exquisite cuisine or enjoy that favorite cocktail at your special spot on board. The choice is yours. Chosen as the European Capital of Culture in 2008, Stavanger lies in southwestern Norway’s stunning fjord region. Old Stavanger has been meticulously preserved with many of its wooden cottages converted into art galleries and boutiques. But it’s the museums that set this cosmopolitan city apart. Visit one of Stavanger’s museums to view collections that include maritime, medical and printing artifacts. Or get outside and take a cruise around the fjords. And when in Norway, one should of course buy Norwegian wool. In addition to wool garments, Stavanger also has glasswork, pewter goods and nautical clothing for you to bring home to friends and family. Trondheim is Norway’s history. The country’s annals are written in the buildings and monuments of the nation’s historic capital. The timbered architecture of the magnificent 11th-century Domkirke was actually built over the tomb of St. Olav and even today, Norwegian kings continue to be crowned within its massive nave. The city has been the keeper of the kingdom’s treasures, values, legends, religious life, national aspirations and in short, Norway’s past since 997 when the Viking King, Olav Tryggvason, established this trading port on this all year round ice-free fjord at the mouth of the river Nid. A relaxing day spent crossing the Arctic Circle. The top of our planet features the otherworldly beauty of glaciers, vivid skies and unique wildlife, like the porpoises that race ships through these arctic waters. Amongst many scenic spots you will see in this area once inside the Arctic Circle, is this Black Glacier – the Svartisen Glacier. It is mighty and in a truly scenic spot. And nothing quite compares to relaxing on deck as you sip hot cappuccino and experience the phenomenal night skies of the Northern Lights! At 08:00 hrs. this morning the ship shall arrive at Honningsvagg, which was completely destroyed during the Second World War, but rapidly rebuilt. Now this beautiful little fishing port, with distinctive pastel-shaded buildings, attracts tourists from all over the world. The gateway to the North Cape, usually considered to be the “top of Europe”, Honningsvag is framed by rugged mountains and the grey Arctic Ocean. Return to your ship in time for departure at 16:00 hrs. On such a ship, there should never be a dull moment, but you are sure to enjoy every moment! From traditional fine dining to endless buffets with custom order action stations, there is a host of delicious choices included in your cruise fare. For an additional charge, you’ll have access to a world of possibilities including gourmet French, Japanese Teppanyaki and an upscale steakhouse. A quaint village nestled in a valley in western Norway, Geiranger grants a respite to remember. Visitors come from all over to explore the fjord and its gorgeous views of nearby waterfalls, mountain capes and charming farms. The magnificent Geiranger fjord is considered by many to be the most beautiful in Norway with towering steep mountainsides and numerous waterfalls. We suggest you explore the beautiful small village or you may wish to join one of the on-board excursions. Situated deep within the valleys of Norway, Flam is a nature lovers’ escape. The towering mountain cliffs and sweeping waterfalls are a pure splendor. A tiny village tucked inside Norway’s longest fjord, Flåm is known for its storybook setting and the thrilling railroad journey that showcases the surrounding splendors of mountains, waterfalls, calm lakes and bucolic green valleys. Board one of the world’s most beautiful railways, climbing from sea level to staggering 2,800 feet. 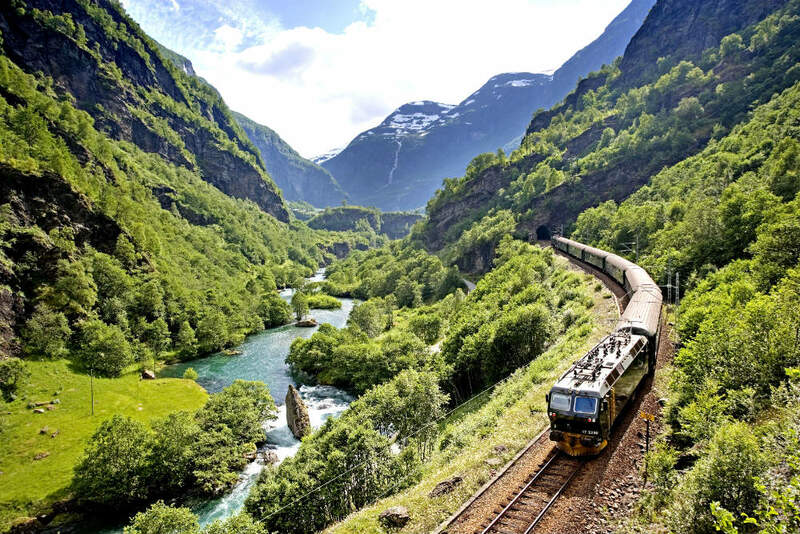 Flam Railway is a masterpiece of engineering, the steepest railway in the world that runs without a cable or rack wheels. On your journey upward, gain considerable altitude as you cross back and forth over rivers and through 20 tunnels. Don’t miss taking pictures of the incredible view from the thundering Kjosfossen waterfall. Although the region of Haugalandet has a rich Viking heritage, Haugesund is a vibrant young city touting culture and arts festivals. The Folgefonna Glacier to the north and the Preikestolen Mountains to the south - creates an enchanting backdrop for seemingly endless possibilities for outdoor exploration. Discover the Langfoss Waterfall - nominated by CNN as “One of the 10 Most Beautiful Waterfalls in the World” - that rushes down a steep mountainside and into the fjord below. Enjoy a scenic hike or bike ride on one of the many trails crisscrossing the landscape or visit the tranquil beaches of Karmoy for breathtaking views. This last full day prior to the end of your wonderful cruise shall be spent at sea. You again shall have ample time to relax and make use of the facilities and other amenities this remarkable ship has to offer. In the evening you will be instructed to leave your luggage outside your stateroom as bags are transported ashore by NCL personnel early next morning.